When Moses was a wanted criminal for murdering an Egyptian who did nothing more than strike a Hebrew, he stopped by Midian to white knight a group of women who were being hassled by some blue collared workers. When one of the girls told her father what happened, the dad invited Moses to eat with them and then repaid Moses’ kindness by forcing his daughter, Zipporah, to marry Moses. In this story Moses’ brand new father in law, the first pimp, is referred to as Reuel (see Exodus 2). In Exodus 3:1, one verse later!, Reuel’s name is changed to Jethro. By time we get to Judges, Reuel/Jethro’s name is changed yet again to Hobab. Nowhere in the Judaeo/Christian literature is it implied that Reuel, Jethro, and Hobab are three different people. Moses may have had multiple wives, but Reuel, Jethro, and Hobab are all known as the father of Zipporah. Some bible enthusiasts claim that these were all his names. Like he would introduce himself as Reuel Jethro Hobab, esquire. But if this is the case, then it’s not explained or even mentioned in the Bible. There should’ve been a footnote or something, Chicago style! It looks more like the story of Moses had multiple authors who were not working in concert. This entry was posted in Atheism, Bible Contradictions and tagged Atheism, Bible Contradictions, Christianity, contradictions in the bible, God, Islam, Jethro, Judaism, Moses, Religion, the story of Moses, Zipporah. Bookmark the permalink. 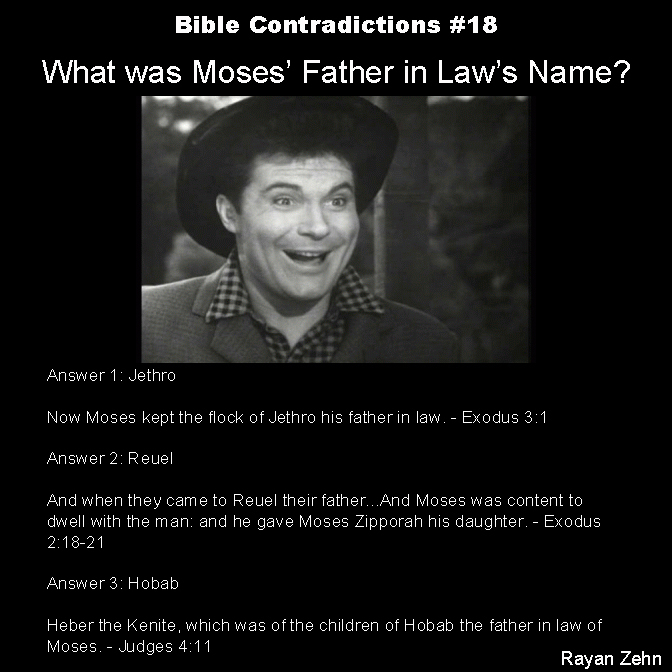 3 Responses to Bible Contradictions #18: Who was Moses’ father in law? Right. Slavery is bad unless the slave is Jew.